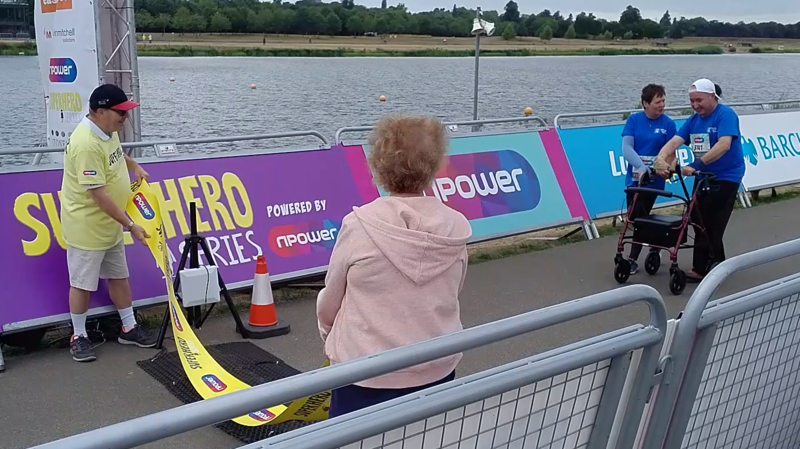 On Saturday 18th August 2018 many of our clients took part in the second Superhero Series Tri at Dorney Lake, Buckinghamshire. When we competed last year, we had 7 teams take part under our team name of Team Wheely. This year, that increased to 12 teams and, with some clients needing buddies to help them take part, it meant we had 49 people competing, making us one of the largest teams there. In addition to our competing this year, our instructor Kris co-presented some of the pre-race warm ups with paralympian Jonnie Peacock and the npower support squad, helping to get people energised and ready to take on their event whilst also having a bit of fun. It was an honour for us to be invited to be involved with this part of the event and great to be able to provide a multi-ability warm up to ensure everyone was included. Throughout the day, Kris, his partner Deane and the rest of the teams were followed by a film crew from GSN, who have been working on a project with us. We can’t say any more about this at the moment, but we are looking forward to seeing how it all comes together later in the year and look forward to telling you more when we can. Words can’t express how proud we are of all of our team members for their hard work, their determination and achievements, and seeing how our clients have grown as individuals, believing in themselves and their abilities more and more as they progress in the classes. Whilst many see the gym and exercise as being about strength, physique and image, at Wheely Good we know it is much more than that: it is about ability, independence, well being, self belief, confidence and maintaining or improving health; about trying to combat the side effects brought on from how we’ve had to adapt to having a physical disability or medical condition, to try to prevent further issues developing as a result; to improve a person’s mental well being through exercise, improving their confidence and self belief to enable them to have a more rewarding and independent life, furthered by the social aspect of being a part of a supportive group of like-minded friends. 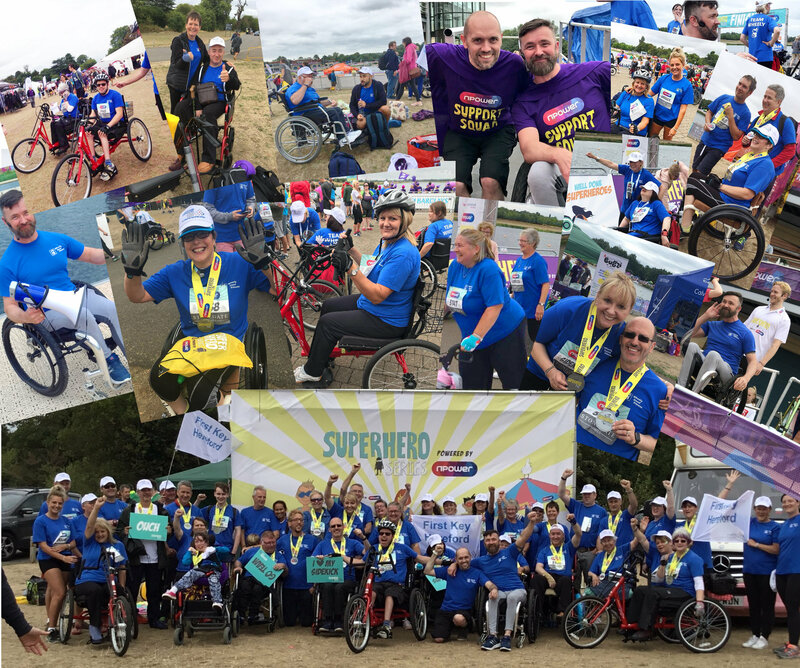 The Superhero Series is a fantastic and unique event, bringing together people of all abilities, age groups and backgrounds, for one great day of equality. Demonstrating that no matter what your abilities or needs, you can take part, because all you need to do is believe in yourself and bring whatever or whoever you need to enable you to take part. It’s an event that we have found feels like home, surrounded by like-minded people all on the same mission, to have an enjoyable day being ourselves. We can’t thank Sophia Warner and her amazing team enough for creating this awesome event and all the many volunteers without whose help this event could not take place, not to mention the huge support of npower and the many other sponsors that are a lifeline to this event taking place. 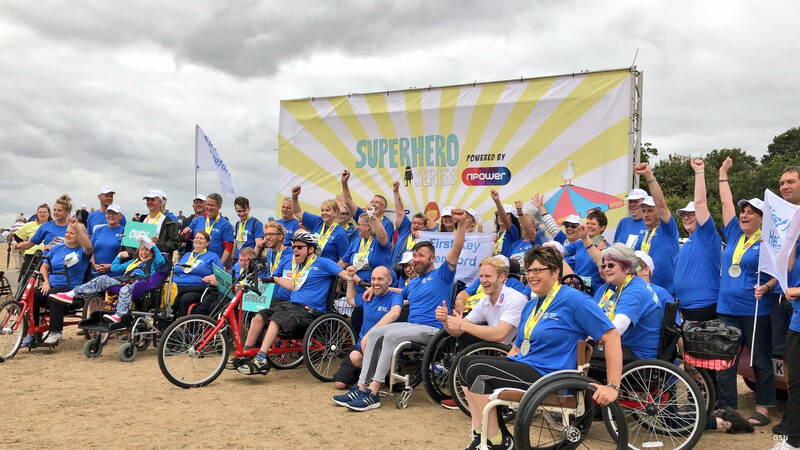 All of our team members are amazing individuals and have made huge achievements not only at the Superheroes Series, but within the classes they attend. However, without taking the spotlight off any of them, we would like to highlight a few individuals and their achievements in the Superheroes Series. Last year Kat, who was relatively new to our classes, took part in her first event at the Superhero Series. She decided that she would like to swim the 150m and set about aiming to make this possible. Taking part in your first event is a huge thing, the self doubt in the back of your mind, the worry of failing, along with all that you have to face being in a new environment and situation that can for many be very daunting. Despite all of this she didn’t give up and though a little quiet in the run up to her event, she proceeded to the water an climbed in ready for the start and when the siren went, off she went. Unfortunately at around 40 metres she got into difficulty, her mind and body decided to disagree, with determination and courage giving way to her body saying ‘no more’ and she was in severe difficulty. She was helped back to shore and despite how unwell she was, all she was concerned about was letting her team down. Of course, the one thing she didn’t do was let her team down; she did the best she could and could have easily given up before even getting in the water or not even come along that day. That day was a significant turning point, as Kat then got to see how valued and respected she was by the rest of the team. No one judged her, they simply embraced what she had tried to do and went out of their way to ensure she knew that she was important to them. From here, Kat was ever more determined to do her 150m swim and put herself forward to compete again this year. From then on she was focused on trying to improve her fitness levels further to ensure she could achieve her goal. 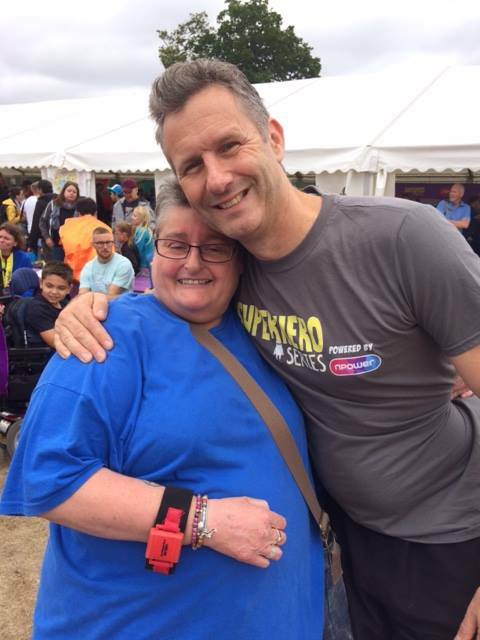 This year unfortunately, her body had other plans and has not been co-operative at all, throwing one thing after another at her, but she still remained hopeful that she would be able to take part. Over the last few weeks, Kat missed her regular classes to give her body every chance of being charged enough for Saturday and we put a fall-back plan in place just in case. Like last year, Kat entered the water, but last minute to help reduce the length of time she was in the water. The siren sounded and off went Kat. Did she complete it? Yes she did! A huge and significant achievement, demonstrating never to give up, even when everything seems to be against you. 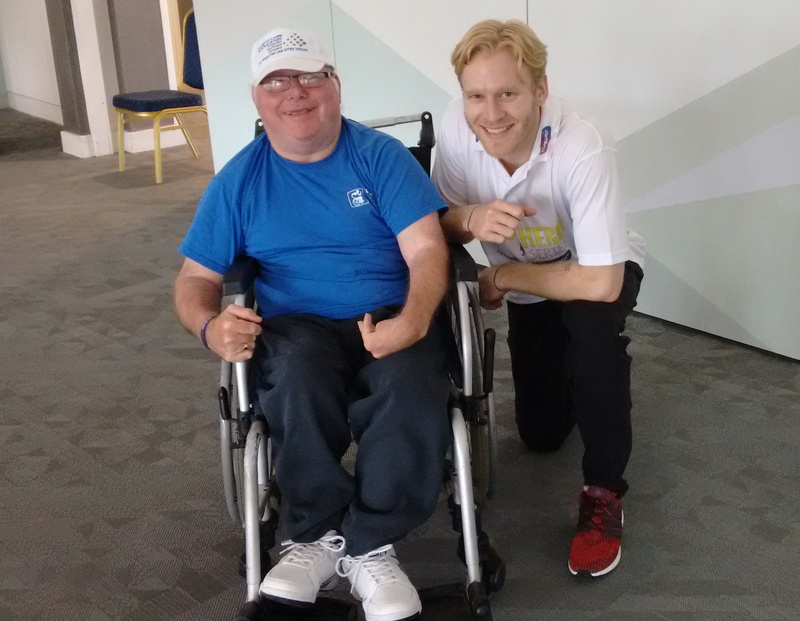 Another person whose participation story we would like to share is Chris, who competed in his first event this year. When we managed to convince Chris to join us at the Superheroes Tri this year he was using a scooter. Although he could compete in his scooter, we discussed an alternative for the race, which was to use a wheelchair. As Chris would only be able to push with one arm, we suggested having a buddy who would be able to assist with his direction and when he reached a distance from the finish line that he felt he could walk with sticks, he could walk across the finish line. This plan only stayed in place for a few weeks as Chris decided to have a go at walking using a walker belonging to someone in the class he attends. This was a significant moment for Chris as he found the walker comfortable and supportive enough to enable him to walk. Since that day we have only seen Chris use his scooter once. With the support of his race buddy Sarah, he trained to become more stable and comfortable with the walker and steadily increased his distance. At the Superhero Series, Sarah was also Chris’s team cyclist and once she returned to the transition area from her 3km cycle, they were off. They took a steady controlled pace and rested when necessary, since this, as for many taking part, was not about speed; it was about taking part and saying ‘I did it’. Chris and Sarah crossed the finish line two very proud if not tired people, cheered on by other members of Team Wheely who were all waiting for that final moment. There were a lot of wet eyes around at that moment and great deal of pride. One other person who we would like to highlight was John. He took part last year in the Superhero Series competing in the 1km sprint. As John can only use one arm, he used a wheelchair that can be pushed and steered from one side. This event was a huge achievement for John as, at the time, he used a power chair the majority of the time. It was assumed by most that this year he would compete in the same event, but we asked him if there was anything else he would like to do and he said, “I can swim, I want to swim”. Due to the limitation of John’s disability this would require a lot of support and planning to make a reality so we asked him if we could look in to it. We spoke with his care provider First Key Hereford and asked if it was logistically possible to make this happen. Their answer was yes and so we put him forward. What John hadn’t told us was that he hadn’t swam for over 12 years! With the help of his care provider and the use of the teaching pool at Hereford Leisure Pool, a practice session was arranged for John. This was to see how he needed to be supported in the water, how to get his wet suit on and off as well as how was best to get him in and out of the water and GSN were there to capture this moment. Come the day of his event, John was pushed down to the water in his wheelchair with his own personal team of buddies. To enable John to compete in the swim he would need 5 people to get him in the water and would need four buddies to swim with him, one at the head, one at his feet and one either side. They took it at a steady pace with John swimming on his back and they completed the 150m swim with finesse and John was beaming when he came out of the water. At the start of the day, Kris our instructor had to attend a rehearsal with Jonnie Peacock and the npower Support Squad. Kris had mentioned this and the warm ups to John and who he was doing them with. John had asked Kris if he was going to be able to see Jonnie himself and he was, but only on stage. However, because what John was doing that day was such a huge thing, Kris managed to get a private meeting for John with Jonnie at the rehearsal, telling John only as they were about to meet him. It’s safe to say it was a very special and memorable day for John. We would like to thank Sophia Warner and all the Superhero Series crew for putting on a such a fantastic event, which is the highlight of many people’s year. Our thanks also to all the volunteers who give their time to help out at this event and who provide so much support to all those taking part. 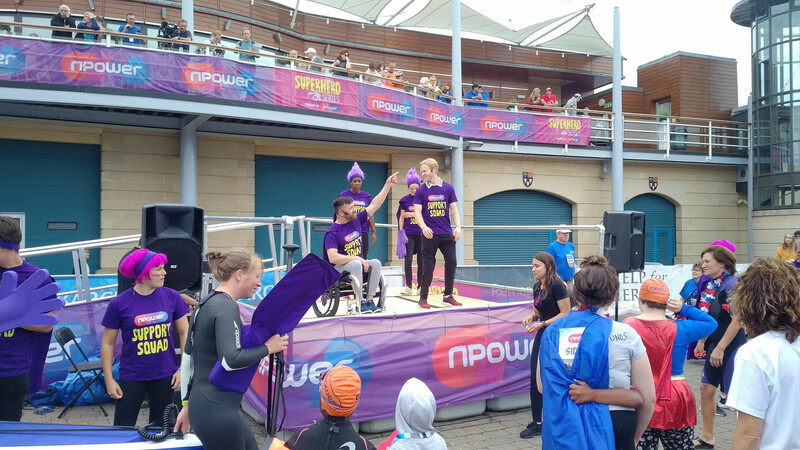 Our thanks also to npower the main sponsor of this event for our increased involvement in helping make this event fun and multi-ability. In addition we would also like to thank Hereford Leisure Pool for the use of the teaching pool and for the loan of the much needed hand bikes for a second year running. Our thanks to First Key Hereford for all the support they have been able to give to us and their clients and to Salutem – Ambito for their support with transport and other resources. We would like to thank GSN for their involvement in our day and for being so amazing to work with. Last but not least our thanks to all of Team Wheely, their family and friends for all their contributions, support and commitment to making this such a fantastic day for all involved.